Although Japan is a relatively small country, it has become known worldwide for housing some of the most innovative and cutting-edge examples of architecture. 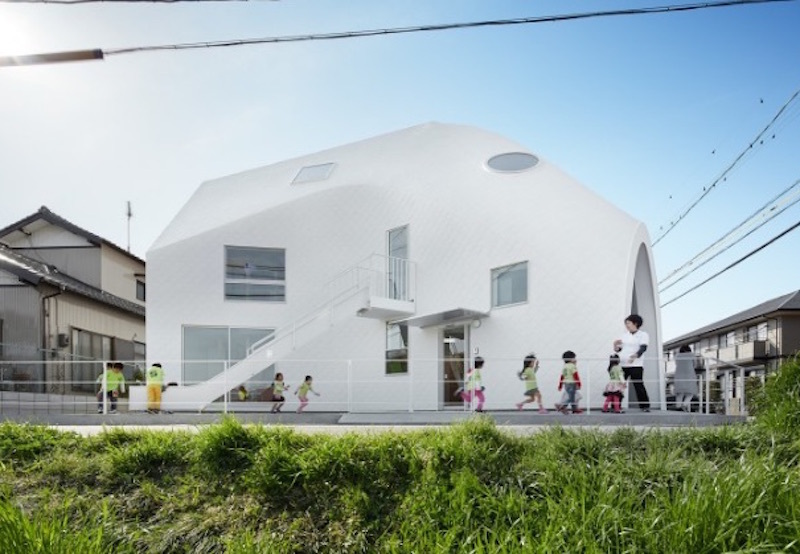 A kindergarten in a rural town about 250 miles southwest of Tokyo reflects this design adventurousness, incorporating the previously existing building (a family home) and adding a bright white "skin" to act as a roof and walls. 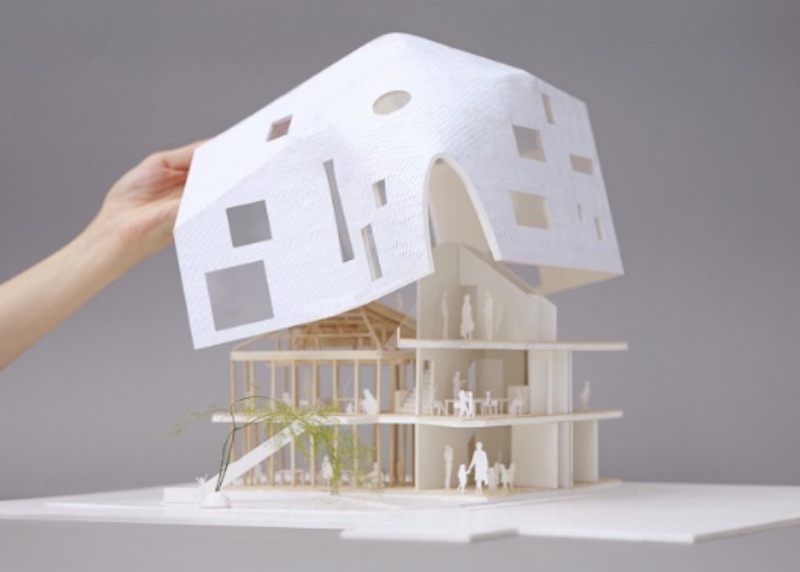 Our favorite part may be the slide that takes kids from the second floor down to the ground-level play area, but you have to see how the architects worked with Clover International School's founders to create the ultimate airy, kid-friendly kindergarten. Kentaro and Tamaki Nara wanted the school they created to feel like “a second home” to students, which makes sense: they operated Clover International School out of their own house in Okazaki until they needed to expand their space. The siblings didn’t want to change locations, so they hired an architecture firm that would honor the “bones” of the building’s original structure but would transform the traditional space into a bigger, brighter, and bolder school. From the outside, the building looks a bit like the shape sorters toddlers are so fond of, with geometric shaped windows dotting the building’s modern white covering. Inside the school, sunlight turns these windows into wonderful sources of natural light and also add an interesting educational element; the light casts ever-changing shadows that gently encourage shape recognition. At night, the school looks like a glowing cave of wonders. We would love to pop over for a sleepover or evening party there! Light colored wood gives seating areas and floors an airy, open, and natural feel, creating a space that is uncluttered and calming. Kid-friendly details were incorporated throughout the design, including having the windows placed at interesting and accessible angles and, of course, that amazing slide! Clover International specializes in teaching English and Chinese to young kids, and they have successfully created a space that is as enticing to learn in as it is to explore. 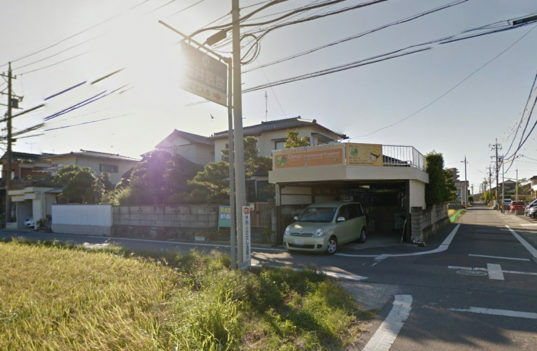 Kentaro and Tamaki Nara wanted the school they created to feel like "a second home" to students, which makes sense: they operated Clover International School out of their own house in Okazaki until they needed to expand their space. The siblings didn't want to change locations, so they hired an architecture firm that would honor the "bones" of the building's original structure but would transform the traditional space into a bigger, brighter, and bolder school. From the outside, the building looks a bit like the shape sorters toddlers are so fond of, with geometric shaped windows dotting the building's modern white covering. Inside the school, sunlight turns these windows into wonderful sources of natural light and also add an interesting educational element; the light casts ever-changing shadows that gently encourage shape recognition. At night, the school looks like a glowing cave of wonders; we would love to pop over for a sleepover or evening party there! Light colored wood gives seating areas and floors an airy, open, and natural feel, creating a space that is uncluttered and calming. Kid-friendly details were incorporated throughout the design, including having the windows placed at interesting and accessible angles and, of course, that amazing slide! Clover International specializes in teaching English and Chinese to young kids, and they have successfully created a space that is as enticing to learn in as it is to explore. This "before" picture of the school shows the striking contrast in design before the amazing update. (Image courtesy Google Street View via Spoon & Tamago).